This may be especially good news right now, since stocks may be due for a pullback. Stocks are off to a strong start this year, but the bulls aren't running in a herd. Bull markets can be found in the stocks of countries around the world, but their movements are less correlated with each other than they have been in the past 20 years. The change brings the return of an important diversification benefit for holders of globally diversified portfolios. Daily one-year rolling correlation of one-month percent change in MSCI indexes for countries in G20 and Spain. This decline in correlation has taken place despite broad economic growth in these economies and in the trade among them. On the chart above, it almost appears to be a return to "normal" for correlation, as the trend illustrated by the standard deviation has moved back to the average level that prevailed for more than 25 years through the 1970s, 1980s, and for much of the 1990s prior to the bubbles in tech and housing. If sustained, this lower correlation - and the risk-reducing benefits of diversification it suggests as markets move more independently of each other - is particularly good news right now. Stocks may be due for a pullback given recent warning signs such as inversion of the yield curve. 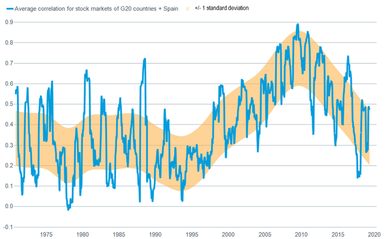 Will the decline in correlation to a 20-year low persist or might global stock markets all slide together? We only have to look back to last year for some evidence that correlations may remain relatively low. Stock markets around the world suffered varying degrees of losses last year, including a sharp bear market decline late in the year. Yet, correlations rose only to the top of the downward-sloping range rather than all the way back to prior highs of 2011. This offers some confidence that even during bear markets correlations may remain lower than in the 2000s. For insights on all of these see our recent article: "Where Will The Next Crisis Come From?" While plausible, these vulnerabilities developing into a crisis are not part of our base case, at least for the coming year or two. The return to the lower average correlation across stock markets not seen in 20 years has the potential to offer globally diversified investors the benefit of less volatility without hampering returns on the path to financial goals - in essence, decreasing risk without decreasing return.